I wanted to make a post now that Thanksgiving is officially over and the winter holiday festivities can commence and introduce a fun idea I had for fun holiday-themed manicures. If you can tell by the post title, I intend to do 25 holiday-themed manicures before Christmas, beginning tomorrow. If you don't celebrate Christmas, then think of it as just a title. 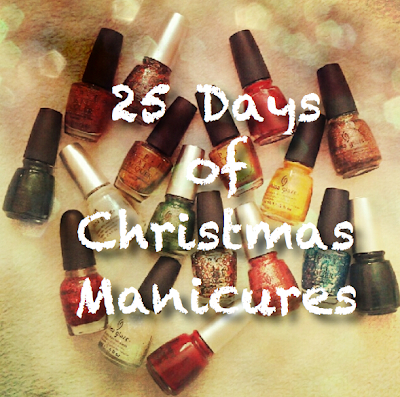 The manicures are simply inspired by the colors associated with the winter holiday season. 2. to get all of you who read this to get into the holiday spirit as well! However, in attempting to do 25 nail posts before Christmas Eve, I will be probably putting the book reviews/miscellaneous posts on hold. But because I do truly love doing the book reviews, after the 25 manicures are posted I plan to do a collective "what I've been reading" post. So keep an eye out for that if you enjoy reading my non-nail-related posts. I hope you enjoy this new series and it gets you in the holiday spirit.